Melody got her first hand-made outfit! 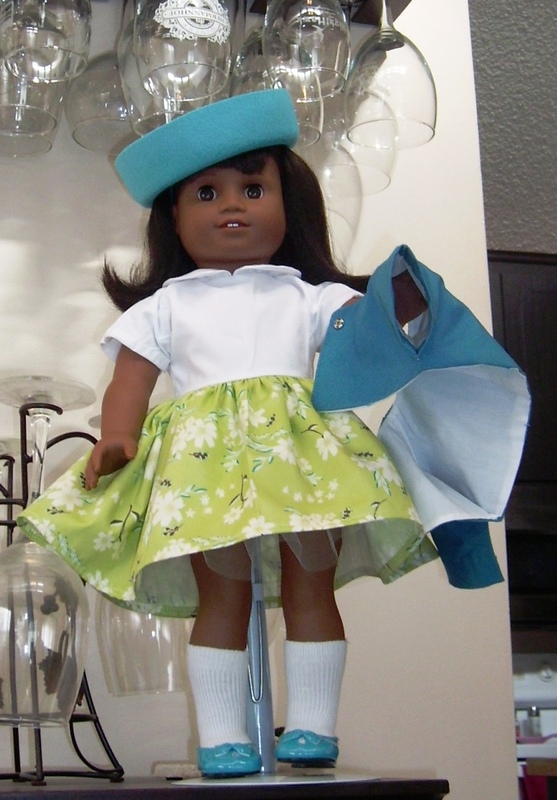 Melody got a lined jacket and a dress from Butterick 6265. It is a reprint from 1957. 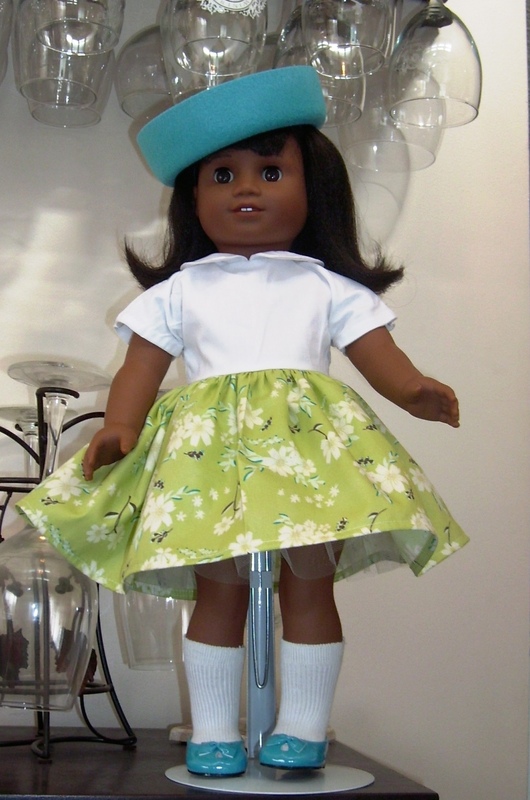 I did a quick internet check to see if the style was still around in 1964 girls sewing patterns. I was able to find some examples so I went ahead with my plan. I have half a yard of this lime green daisy print quilting cotton that would work well for the skirt. The pattern shows the jacket and the skirt matching, however, my print was just too big for the jacket to look as nice. So for the jacket, I decided on a coordinating solid (probably a little more of a contemporary look since it isn’t matching). Lets start first with the lined dress. I think the main reason the bodice is lined is for a clean finish at the neck line. The instructions have you sew the neckline and end of sleeves of the lining and outer fabric together. Side seams I finished off with my serger. Skirt and petticoat are sewn on after the side seams are finished. I did cheat on the netting petticoat. I bought one of the 6 inch wide rolls of tulle and just used that. I didn’t follow the pattern piece but just took a length off the roll and baste stitched it. Then I matched it up to the skirt piece; gathering as needed. The skirt was basted and gathered to fit the bodice. To be honest, with the amount of gathers in the skirt, one probably doesn’t need the netting petticoat that is included in the pattern if you use a quilting cotton. On to the jacket, the lined jacket was actually easier than I anticipated and I had it completed before dinner the day I cut it out. It is just 2 pattern pieces the jacket front and jacket back. In the end, I decided to construct all the outer blue fabric together as one time. Then after a break, I cut out the lining and put it together. The lining and outer fashion fabric are sewn together on the outside edge, then slipped through the opening you leave at the bottom. That opening is hand sewn closed. So after a good press, it was on to attaching the sleeve lining to the outer fabric. It was not able to be machine sewn so it was hand sewn also. Lastly, I decided to just sew in a snap so the jacket can close but still have the simple front. To be honest, I think this jacket would look so cute with jeans and a t-shirt also. 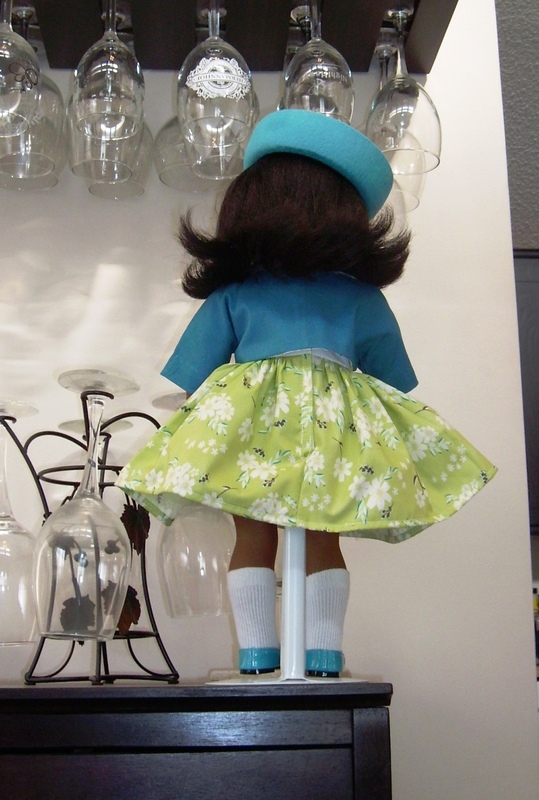 I was able to sneak another doll outfit in between items for my dad. This time it was Molly’s turn for a new dress. 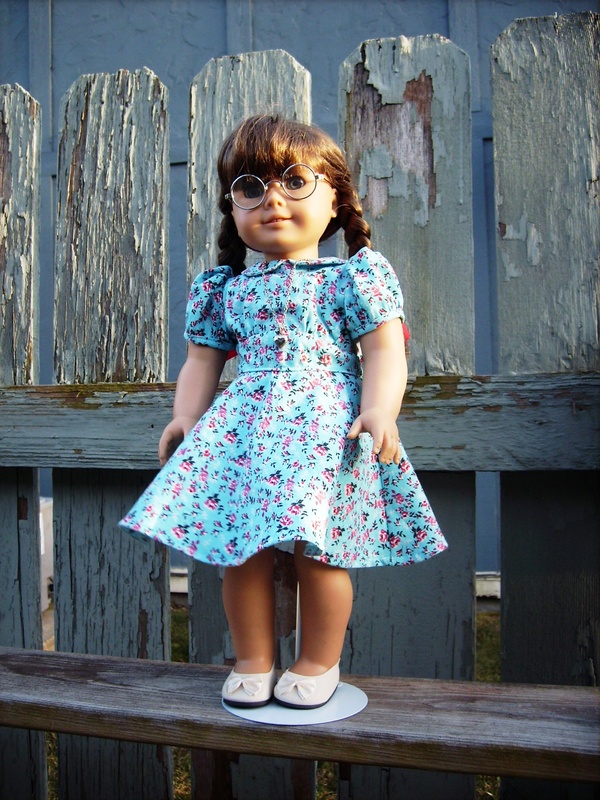 For Molly’s new dress, I decided to try out a new pattern designer, K&R Vintage patterns. The patterns are scaled down children’s sewing patterns. 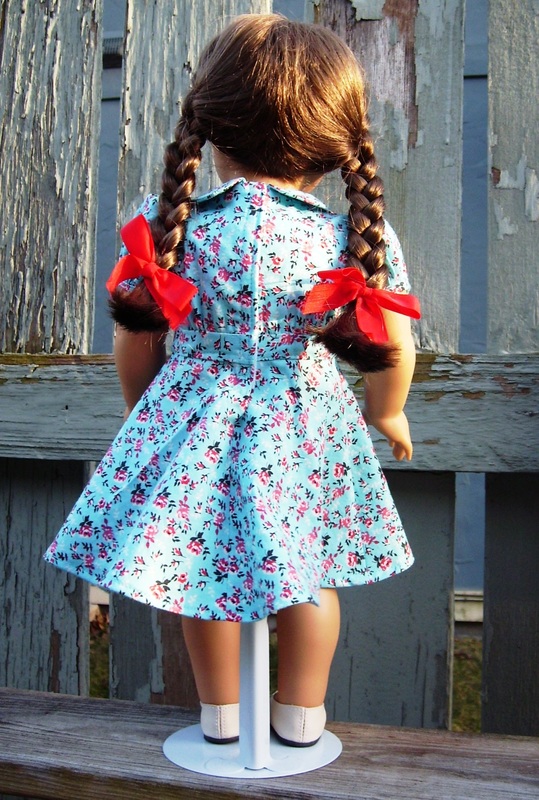 It was nice to be able to say you made a real 1940’s dress for your doll. The one I chose was Simplicity 3234 (rough estimate of 1940-ish). This was another time that my fabric stash let me down. I just couldn’t find anything in it that fit my vision of what Molly’s dress should look like. So it was another trip to the fabric store. There I came across this lovely aqua floral quilting cotton that ended up being perfect. I decided against trim for the collar of the dress and opted for letting the print be the main focal point. I figured the dress could be trim-less because Molly didn’t have enough rationing coupons for lace. I only made the dress, but I did notice that the cutting layout has you include an item for the pinafore (Pinafore Belt N) on the dress layout. If you are just making the dress, it isn’t needed. If you are making the pinafore, you probably should decide whether you want it out of the pinafore fabric or the dress fabric. 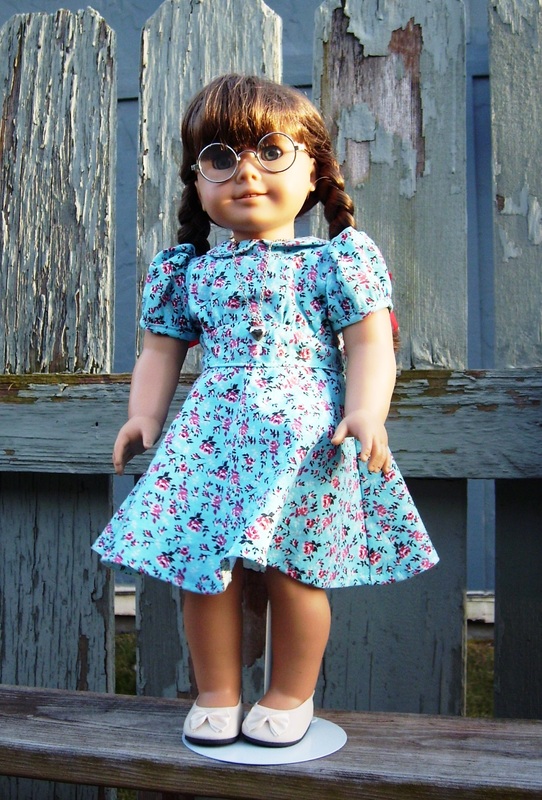 I didn’t do any pattern alternations even though I know Molly is on the larger size of dolls. However, I knew that I was not going to keep the button back closure. I inserted the collar. For the lining I only stitched the neckline seams (I didn’t continue it down the sides). Then the bodice and lining were ironed flat. Sleeves were stitched to both outer fabric and lining then ran through the serger for seam finishing. I really didn’t want to hand sew the lining to the sleeve. Bottom of bodice (and lining) were basted for gathering into the “belt” waistband pieces. The bodice was attached to the waistband. Skirt was attached to waistband. Then I measured to find where the center back was on the pattern piece. It was half-inch from raw edge. My Velcro is quarter-inch wide, so I subtracted that out from the half-inch and used a three-eighth seam allowance for the back. Overall, the pattern was fairly easy to put together. 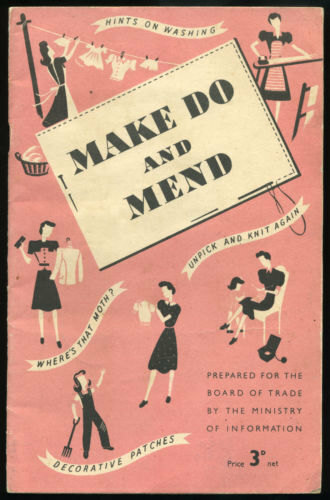 Since, it is a scale down of the 1940s children’s sewing pattern, the instruction may confuse a new seamstress. In the center is the original pattern instructions. 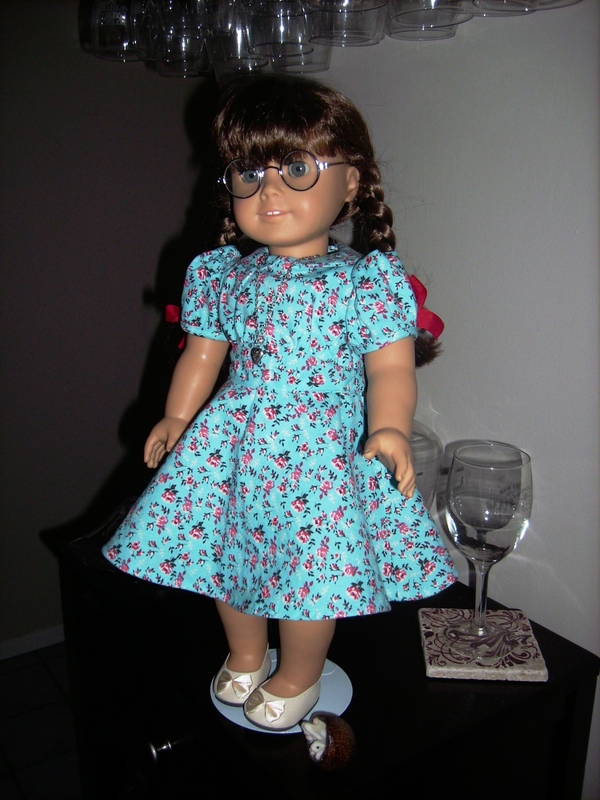 The instructions along the sides is how you put together your doll dress. I did print out the instructions just because I was not certain about the instructions layout. But otherwise, it was easy to follow. Slowly working through my dolls, next up will be Melody. 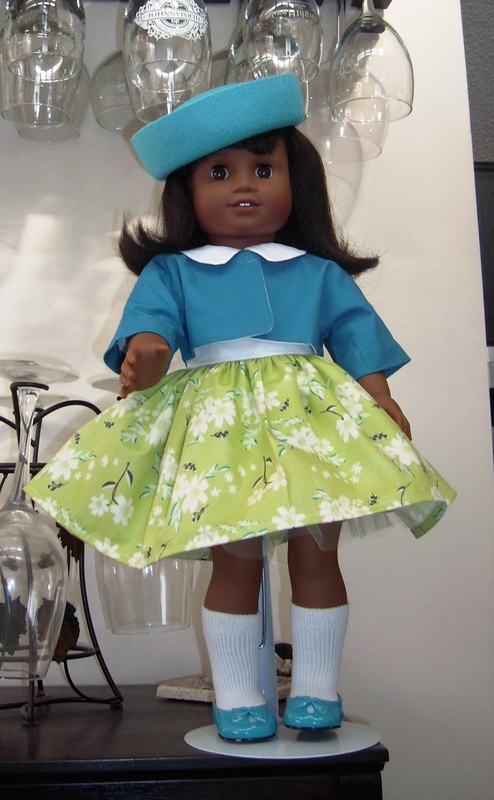 I have a Butterick pattern picked out and some fabric. I just need to decide what fabric to use for the jacket. Here is the follow-up on what I learned last time. As for closet organization, I took some measurement of the shelves that are in my closet. After looking around, I dragged my dad to IKEA (we were probably the only two there that don’t care much for IKEA). There I was able to pick up six larger plastic boxes and three smaller plastic boxes with lids. I didn’t remember my closet correctly and am short two big tubs and one small tub. I thought I had 3 shelves not 4. Just something to note, the lids never really clicked or snapped into place. It seems more of a topper instead of an air-tight lid. Next up on the list to tackle was moth prevention. Everything on the internet stressed the health risk of using mothballs and that it is a danger to pets. I decided to use a combo of cedar and lavender. As for cedar, I went to the laundry care aisle and bought so many cedar disk. For the lavender, I decided to try using reed diffusers since I do have a fairly large- sized closet. However, it seems like reed diffuser are going out of style because I couldn’t find any reasonable priced. I decided to try to make my own. As of right now, I have bamboo skewers for the reeds in a small bottle filled with diffuser oil from Walmart. I am not sure if it was meant for reed type diffuser or a warming pot sort of diffuser. Plus I also am trying out a solid air freshener in lavender too. As of now, with an allergy induced troubles, the solid air freshener seems stronger. I have seen that you can make your own reed diffuser oil on the internet and will try that out too. One interesting item to note is the moths that eat clothing don’t like light. So I may consider the option of a touch light later in my closet but I need to get things clean up and organized how I want it before considering lights or not. So far, the closet is only about half way cleaned. I still need to work on finishing it up but it will probably be put on hold until after the siding/ windows are done. The siding company called yesterday saying they are ready for installing and would start today (like two days before a snowstorm). Fortunately, my dad told them no way, that they need to wait until beginning of April. So I have a little bit of time to move stuff away from windows and doors (and get the bunny packed up for an extended visit to grandma). After making some doilies for my mom’s Christmas, I decided to start one for my craft/ guest room to put on the pattern file cabinet (but then was sidetracked with the crochet animals for a month). I originally started off with another pattern from the Coronet from Coat’s & Clark’s #197 (same book as my grey Brocade doily). I only got to row seven then was stuck. The row really didn’t look like the picture at all. So abandoning the Coronet, I searched through the other crochet patterns I had and settled on the Spanish Fan (#S-897) from Coat’s & Clark’s #324 Priscilla Doilies to Crochet (circa 1956). The main deciding factor was that the caption above the picture stated “The elegance of simplicity… a charming design that is easy to crochet, even for beginners”. It didn’t hurt that there were also, 5 other doilies listed in Ravelry. At least I knew others had made it. 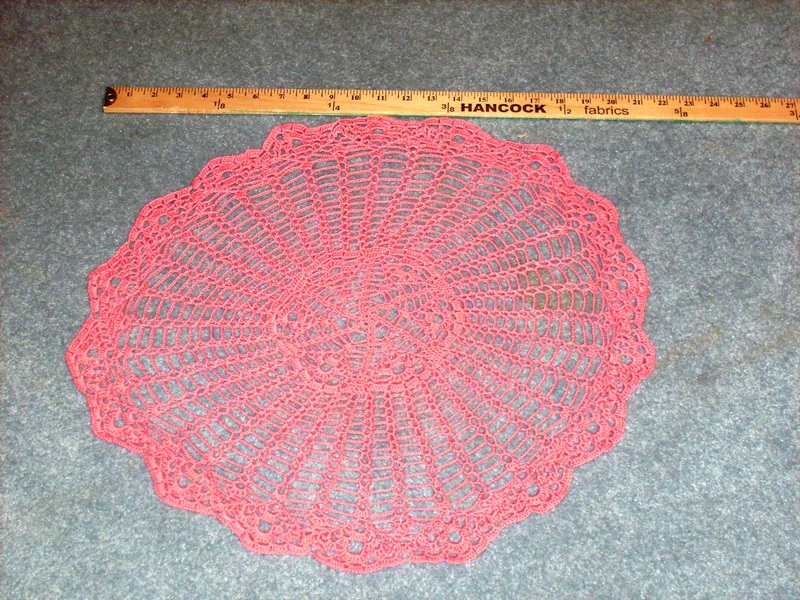 I used Aunt Lydia’s Classic crochet thread size 10 in coral instead of the size 30 thread requested in the pattern. I also used a B sized crochet hook (2.25mm). 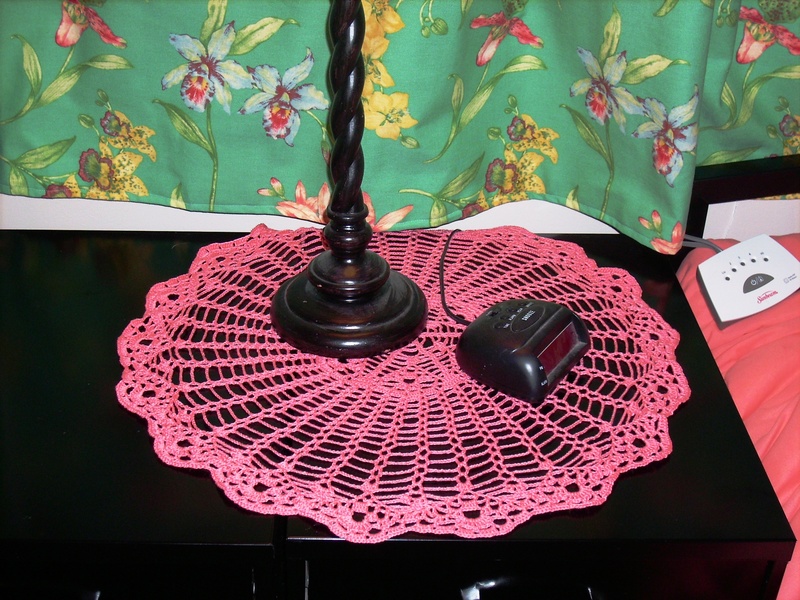 In the end, my doily was about 21 inches wide. This is one time I may have to agree with the pattern book. 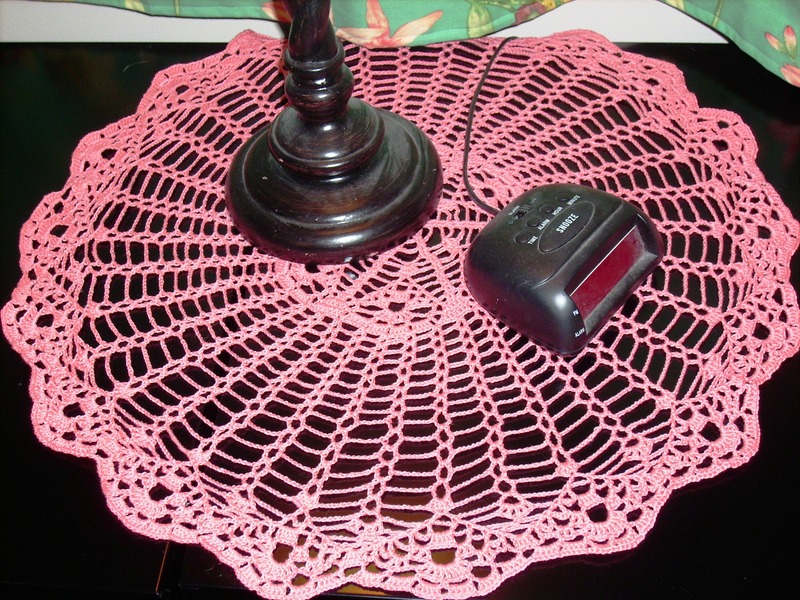 This was a fairly easy doily to crochet. I had the first 5 rounds completed before Christmas. So when I recently re-picked up this project I did have a little trouble trying to figure out where I left off at. But after that was sorted out, I was able to follow the pattern very easy. I didn’t complete round 34. I did start the round which has picots in the chain between the double crochet stitches. My picots looked so messy that I decided it was best to finish it at round 33. Upcoming crochet projects include a doily for my mother for Mother’s day and making Emma the bunny from “Edward’s Menagerie”.